Learn how to effectively conduct a warehouse assessment. 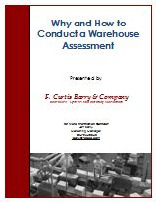 This whitepaper will teach you how to effectively conduct a warehouse assessment. It will help you measure how productive your operations are, and identify areas of improvement in your operation's productivity and services.